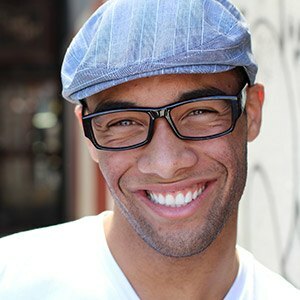 Are you self-conscious about your smile because of cracked, broken, decayed, or worn teeth? Dr. Boehmer can help you bring back your healthy, natural-looking smile with a custom-made dental crown. A dental crown restores strength and function to a seriously damaged tooth. Traditional crowns require a two-appointment procedure: one for preparation and impressions and then another for placing the restoration over the prepared tooth. Your time is important, though, and we want to make restorative care convenient for you. With our state-of-the-art CEREC and E4D milling units, Dr. Boehmer can provide you with a solid, aesthetically pleasing crown in just a single appointment. Why Choose Us for Same-Day Dental Crowns? These restorations contain no metals. Patients won’t require temporaries – the finished crown is ready right away. The crown is fully customized and provides a precise, stable fit. Its shade can also be closely matched with your natural smile for the most seamless result possible. Your new smile addition should last for several years. 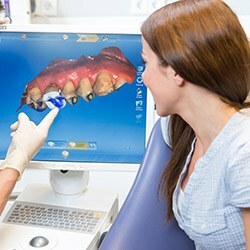 All impressions are handled digitally for maximized accuracy and elevated patient comfort. 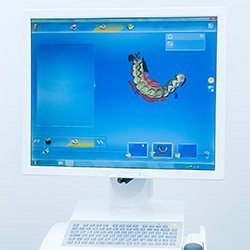 How Does Restorative Dental Care with CEREC and E4D Work? Both systems use digital technology to simplify the restoration process. Treatment with CEREC or E4D begins with Dr. Boehmer taking a scan of the tooth we will be restoring. With that scan, we can design your restoration and let you preview how the final product will look. When we design a crown, we pay special attention to matching the shade and luster of your existing teeth. We can also add contours and other natural features to create a restoration that perfectly complements your natural smile. Once your crown has been designed, you'll just wait briefly in our office while our CEREC or E4D unit mills the final product from durable esthetic porcelain. Afterwards, all that's left is for Dr. Boehmer to place your finished crown over your prepared tooth. We know you lead a busy life. It's hard to fit multiple dental appointments into a modern-day schedule. Providing same-day turnaround for tooth restorations like crowns and veneers is another way that we combine cutting-edge technology with premier service for our patients' benefit. If you are ready to experience oral care tailored to your needs, contact our Albuquerque dental office and schedule an appointment with Dr. Boehmer. Our relaxing, Northeast Heights Albuquerque practice is easy to access. Stop in and see how our personalized dental care services can transform your smile.